Holy Rosary-St. John welcomes Father Ramon Owera, CFIC, as the new Parish Administrator. Fr. Ramon is originally from the Philippines. He was born May 29, 1964, and is one of seven siblings. He entered the seminary of the Congregation of the Sons of the Immaculate Conception (CFIC) in 1989. He made his first profession of vows in Rome on September 22, 1991, and that of perpetual vows on September 28, 1997. After his ordination on May 30, 1998, he was assigned as a vocation director of his religious order for two years. In June of 2000 to September 2005, he was assigned to the seminary as a novice master, formator and superior. In October 2005, Fr. Ramon was assigned to St. Paul, Minnesota, as a hospital chaplain. On September 28, 2007, he was transferred to the Italian parish of the Immaculate Conception in Woodbridge, Canada. On March 7, 2011, Fr. 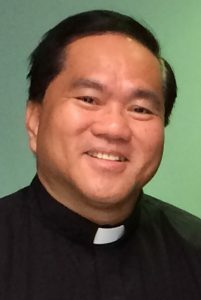 Ramon was transferred to Holy Cross Parish in Columbus as his residence while performing ministry at Mt. Carmel East and West, St. Ann, Riverside Methodist, Riverside Dublin, and Doctor’s West hospitals. On July 12, 2016, Fr. Ramon was appointed as the administrator of St. Elizabeth in Columbus. Fr. Ramon now joins us as Parish Administrator at The Community of Holy Rosary and St. John the Evangelist, and we welcome him and look forward to working with him.